Local dad, Jim Davis of the Gatlinburg Depatment of Tourism, offers this list of great fun (and free!) things to do in and around Gatlinburg. Thanks Jim!! Put on your walking shoes, get out of the car, and join in the great family tradition of the downtown Parkway stroll also known as the center of excitement to those who visit Gatlinburg frequently. Explore every nook and cranny where you’ll find more than 200 unique shops, dozens of restaurants, and attractions for all ages. As you stroll, be on the look-out for homemade mountain taffy pulling, mouthwatering caramel apples being dipped or delectable fudge being prepared. You might just choose to play miniature golf, experience the world’s largest underwater aquarium tunnel, ride America’s largest aerial tram, take an elevator of chair lift to the top of the town, visit the unique museums or take a turn on live-action rides along the way. You can even people-watch! If you need an “away from it all” moment, take a leisurely stroll along the Riverwalk that runs along the Little Pigeon River one block off the downtown Gatlinburg Parkway. Feed the ducks, watch as fishermen cast their flies in hopes of landing a mountain trout, or relax along the riverbank as you listen to the swift river flow before you. Admire beautiful arrays of flowers and dip your feet in the brisk mountain river. Find the perfect photo spot and help assure that your moments in Gatlinburg are never forgotten. Need to rest your feet? Jump in your car and explore a collection of historical sites on Roaring Fork Motor Nature Trail including the preservation of a homestead owned by the Noah “Bud” Ogle family who lived in Gatlinburg after the Civil War. See log cabins, Roaring Fork Cemetery, and the remains of a village that supported some two dozen families more than 150 years ago. The motor nature trail is accessible to automobiles via the eight-mile one-way paved road. Many stops along the way allow you to get out, take a deep breath of mountain air, step back in time as you visit the sites and enjoy the aura of the mountains. Located at Great Smoky Mountain National Park’s main northern entrance two miles south of Gatlinburg along Newfound Gap Road, (U.S. 441) Sugarlands is a visitor center you should visit. A free 20-minute orientation motion picture provides an in-depth look at the Smokies and the enormous diversity of plant and animal life in the Park. Natural history exhibits include mounted specimens of park animals in recreations of their habitats and reproductions of journals kept by the first park naturalists. Ranger talks and slide shows are presented daily from spring through fall. Just a few miles outside of Gatlinburg and is a hidden jewel known as Greenbrier. A plethora of daytime fun and free outdoor activities can be enjoyed at this area of the National Park, located just east of Gatlinburg. Tube, swim, picnic, hike, sunbathe, or mountain bike. Ramsey Cascades Trail Head is also located here. Historical cabins, farmhouses and churches are maintained in Cades Cove, a western valley in Great Smoky Mountains National Park. First settled by Europeans in 1819, today, the National Park Service maintains a historical and cultural preserve of log cabins, churches and other structures. The 11-mile one-way road passes by 19 numbered tour stops as identified in the pamphlet available at the entrance. Be sure to bring your camera in hopes of spotting wildlife such as deer, bear, turkey, owl and fox. If you prefer, you can also experience the loop on horseback or bicycle! See Gatlinburg from a bird’s eye view from the two overlooks in the Great Smoky Mountains National Park. It’s the perfect souvenir photo spot and one of the most popular places to watch the sun rise. 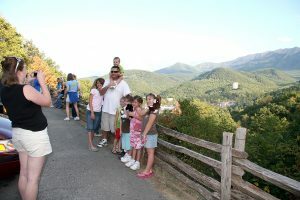 So grab your cameras and head up to Gatlinburg Overlook and enjoy the view! Indulge in a little culture as you browse the galleries of Arrowmont School of Arts and Crafts. Arrowmont has developed into a leader of contemporary arts and crafts education. Founded in 1945, the school has developed into a leader in arts and crafts education, with an annual enrollment of more than 2,000 students from the United States and abroad. Stop by and tour select collections of the art galleries, the resource center and the book and supply store. Take a trolley ride or take a leisurely drive to visit the eight-mile loop of Great Smoky Arts & Crafts Community and see craftsmanship at its best, as artisans using simple tools and skillful hands whittle, carve, cast, sew, weave and transform raw elements into works of art and function. Great Smoky Arts & Crafts Community is recognized internationally as the largest group of independent artisans in North America with nearly 100 shops, studios, galleries, cafes and lodging options. Find great rates on hotels in Gatlinburg using our secure reservations system. Jim – These are great tips – good to have right at your fingertips! We have traveled to Gatlinburg TN many times, and really enjoy hiking in the Great Smoky Mountains, and having this list of free things to do is a great idea for families! Thanks again. .-= Kid Friendly Family Vacations Mom´s last blog ..Sep 26, Free Walking Tours of the Washington DC Monuments and Arlington Cemetery =-. There is so much to do in Gatlinburg TN but is is nice you have compiled a list of free things to do which is helpful to everyone on all budgets. Gatlinburg looks like a lot of fun for kids AND adults alike. Sometimes all it takes is just a little bit of planning and all the family will have a great day out! Don’t forget the Ripley’s Aquarium in Gatlinburg, truly a terrific and kid-friendly place to go! 11. How about a family-friendly hike through the Smoky Mountains? BTW, great post! There’s certainly no shortage of family fun to be had in the Gatlinburg area. .-= Gatlinburg Lodging Guide´s last blog ..Normal Stops: Clint’s Family Restaurant =-. we have 6 hotels with 640 rooms located in the heart of Gatlinburg and we always have great deals and specials going on!